Tomorrow night, Malachy Nugent will gavel in his last meeting as chair of ANC 3F – and his last as the commissioner representing the single member district 3F06. Why? He and his family are packing up and moving to Delhi, India, where he is taking up a diplomatic assignment for the Treasury Department. Undeterred by our exit interview of former commissioners Sally Gresham and Mary Beth Ray, Nugent agreed to answer our questions about his service. When were you elected to the ANC? What attracted you to becoming a commissioner and what did you hope to accomplish? My wife and I are longtime residents of the neighborhood. My first apartment in the city was in the Frontenac, our first home was a condo in the Parker House, and we’ve been in our current home on Appleton Street for almost 15 years. We love the neighborhood and have always been committed to seeing it grow and develop. Becoming a Commissioner was a way to help support that growth. And personally, I liked having the opportunity to engage on a very local level, dealing with things that affect our lives every day. What are most proud of in your service to your community? I’m proud that my colleagues and I have been able to give the residents of ANC 3F a voice on the local issues that matter most to them. As the most local level of DC government, the ANC is vital to making the DC government responsive to local needs, and we’ve worked hard to ensure ANC 3F fills that role efficiently and effectively. That’s why we’ve focused so much on transparency, public engagement, and accountability. 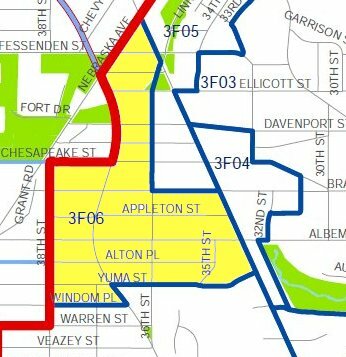 By doing things like relocating our meetings to UDC, revamping and expanding our website, and increasing our use of committees, I believe we have made it easier for the residents of ANC 3F to stay informed and engaged on the issues that matter to them most. What were your most difficult challenges as a commissioner? Time and resources. I think we could all use a little more of both. What is your advice to the next commissioner who takes over representing this SMD? Make the most of the energy and expertise that exists in our neighborhood. Keep people informed and draw on them as a resource when needed. Become an expert in TOPS and 311.dc.gov and get to know the ANC liaison at each of the key agencies. Don’t keep all the paper; there’s always an electronic version somewhere. Stay on Marlene‘s good side; she buys ink by the barrel!